To overcome people’s short attention spans, make your marketing message short and sweet. A study shows that people’s initial attention span is as short as 8.25 seconds. That compares to a goldfish’s attention span of 9 seconds! To break through short attention spans, get to the gist in a few seconds. Short marketing messages get to the gist fast – in 7 seconds, 23 words or less. Why? Seven seconds is the average length of a sound bite when the company’s spokesperson gets quoted in news media. 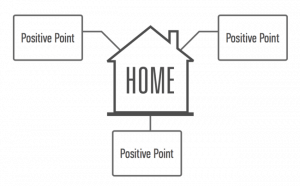 Message Maps include 1 main message called home base, plus 3 positive points to prove it. This 1 + 3 message structure is optimal because it minimizes people’s cognitive load and avoids overtaxing the human brain. Deliver one clear, concise, consistent message over a long period of time. That practice makes your marketing message easier for customers to recall and act on at decision time. Why? Because consistent messages get stored in people’s place cells, which never run out of capacity – unlike their short-term memories. If you want other people to share your message on social media, make it even shorter. On Twitter, the most-shared posts run about 70 characters or 14 words. 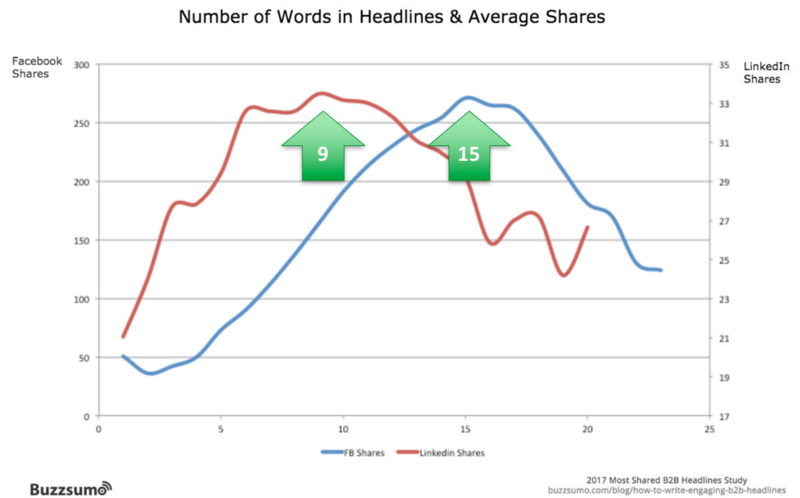 On Facebook, the most-shared posts are 15 words, a BuzzSumo study of 100 million headlines found. On LinkedIn, posts of 9 words get shared the most, BuzzSumo found. 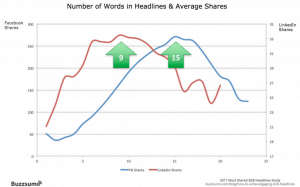 To maximize shares, keep your social media message short and sweet: 9 to 15 words. A sweet message instantly answers people’s question, what’s in it for me? WIIFM? It hooks your audience by leading with benefits. Delete any message elements that elicit a “Who cares?” or “So what?” response. The new software saves your business time and makes your life easier. The new network increases uptime, so you get fewer calls on nights and weekends. The new facility shortens most people’s commutes, making it easier to recruit new hires and increase employee satisfaction. Make benefit statements even more believable by adding social proof, such as testimonials, case histories, ratings, rankings, third-party certifications and endorsements in social media. The topics buyers are interested in. The questions buyers seek answers to. The obstacles buyers must overcome. The people and media buyers seek out to find answers. A Dun & Bradstreet (D&B) survey of more than 300 B2B buyers in North America and the UK shows how well sales and marketing messages perform in the eyes of buyers. About half (51%) of buyers say sales and marketing communications are better than a few years ago. The other half sees no change or says it’s worse. 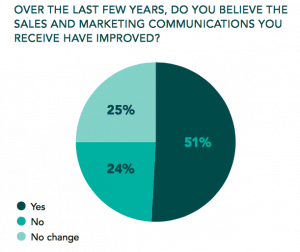 Half of buyers see improvements in sales and marketing communications over the past few years. One-fourth say there’s been no change. One-fourth say it’s worse. 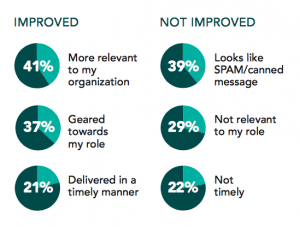 When you dig down to why marketing communications are better or worse than before, it boils down to two issues: message relevance and timeliness, according to a Dun & Bradstreet survey. Buyers who see improvements say that today’s communications are more relevant to their organization (41%) and more relevant to their role (37%). And 21% find the communications more timely. Buyers who see no improvements say they get too many irrelevant communications that look like spam or canned messages (39%). Another 29% say the communications are not relevant to their role, and 22% find the communications untimely. Buyers want marketing messages that are relevant to their organization and role, delivered in a timely way. Remember, what Sales wants most from Marketing is better messaging. Use a Message Map to create a one-page message that every customer-facing employee can use to deliver the message successfully. Overcome buyers’ short attention spans. 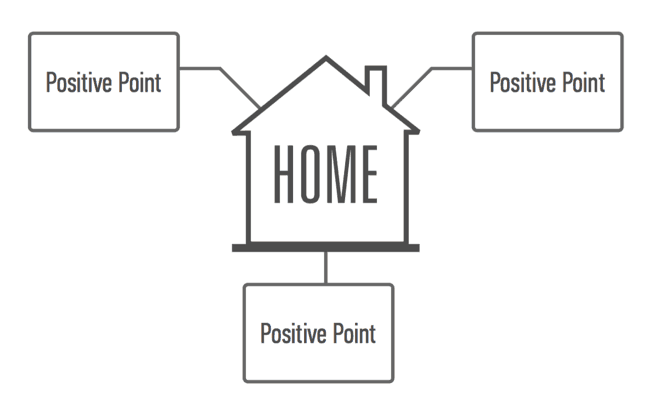 Meet buyers’ need to know what’s in it for them. Ensure your message is relevant to each buyer’s company and role. That’s how you break through with the message, short and sweet! For more ways to keep your message short and sweet, subscribe to our blog.